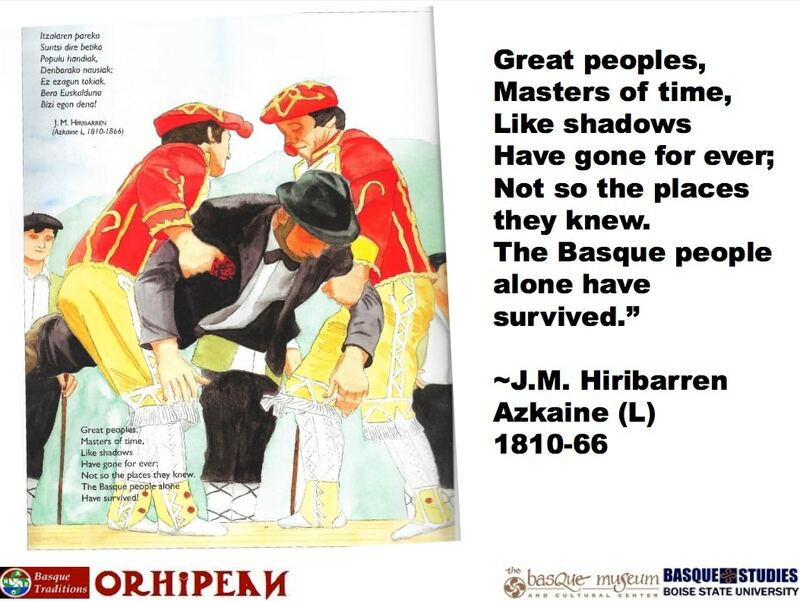 The Center for Basque Studies at the University of Nevada, Reno has been cited on many occasions in our blog for obvious reasons, revolving around their extraordinary work in studying, conserving, and spreading Basque culture in general and about the Basque diaspora in the US in particular. We found, almost by accident, a presentation on their website that discusses, in 37 slides, a good part of what the Basques have been and are. It’s a document that was prepared to present the book ORHIPEAN: The Country of the Basques by Juan Carlos “Xamar” Etxegoien. It’s about a trip from the summit of Orhi, in the Pyrenees between Soule and Navarre, which is one of the homes of Mari, the Mother and main goddess of the Basque Pantheon, which ends up reviewing the culture. Orhiko xoria, Orhin laket (Z), Orhiko txoria, Orhira tira (N), meaning “The Bird of Orhi feels good in Orhi, The bird of Orhi, will always want it (N). Mount Orhi (2017m/6617ft) lies between Soule and Navarre. At its base at Orhipean (below Orhi), century by century over millennia, all forms of existence developed. In such a long period of time, many different peoples and cultures reached here, and from the relationships between all of them, both peaceful and bellicose, the local Basque culture has usually come out richer, in that it never lost its own personality, but adapted to all types of different situations. Today, however, we’re watching the destruction of our culture. This is largely due to the fact that we don’t know how to appreciate it, given that we don’t even know it. And it won’t be too many years before we see the final clear demonstrations of what it still is. On the other hand, what has been recovered so far has not been conveniently transmitted and much of this knowledge appears in brainy institutional publications, normally written in Spanish. Not only in research, but also at an educational level, there is still much work to be done. There, dear reader, is where you must put the book you have in your hands. It is not a thesis; nor is it one of those thick volumes that is never used. But it is a shortcut, an easy trail to follow, that will take you quickly–or so it hopes to–to that which is called a People, a People that might even be yours. If these pages show you something you didn’t know about it–or about yourself–the author will consider himself satisfied. My most sincere thanks to J.M. Sánchez Carrión “Txepetx”, the Pamiela publishing house, Iñaki Camino, and especially Joxeanjel Irigaray, for the attention and intention with which they read this text. Garralda, under Orhi, Midsummer’s (St. John’s) Eve 1991. It’s a historical, geographical, and existential trip through the life of a People, which is well summed up in the verses of J.M. Hiribarren Azkaine from Labourd. Itzalaren pareko Suntzi dira betiko Populu handiak, Denborako nausiak;Ez esagun tokiakBera Euskalduna Bizi egon dena Great peoples,Masters of time,Like shadowsHave gone for ever;Not so the places they knew.The Basque peoplealone have survived.” Grandes pueblos, Maestros de la época, Al igual que las sombras Se han ido para siempre; No así los lugares que conocían. El Pueblo vasco sólo ha sobrevivido. We’ll leave you with links to the book (in Basque, English, Spanish, and French) and this small jewel from the presentation itself.